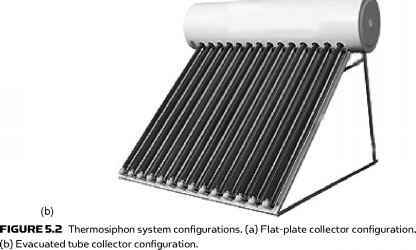 FIGURE 5.1 Schematic diagram of a thermosiphon solar water heater. replaced by the cooler water that has sunk to the bottom of the tank, from which it flows down the collector. Circulation is continuous as long as the sun is shining. Since the driving force is only a small density difference, larger than normal pipe sizes must be used to minimize pipe friction. Connecting lines must also be well insulated to prevent heat loss and sloped to prevent formation of air pockets, which would stop circulation. The advantages of thermosiphon systems are that they do not rely on pumps and controllers, are more reliable, and have a longer life than forced circulation systems. 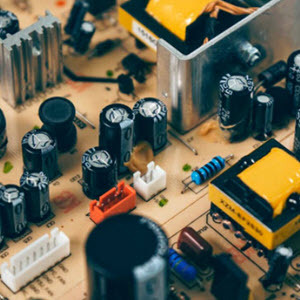 Moreover, they do not require an electrical supply to operate and they naturally modulate the circulation flow rate in phase with the radiation levels. The main disadvantage of thermosiphon systems is that they are comparatively tall units, which makes them not very attractive aesthetically. 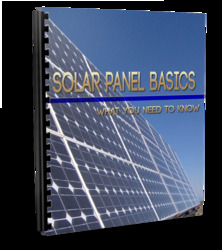 The two types of thermosiphon systems are pressurized and unpressurized. In pressurized thermosiphon units, the make-up water is from city mains or pressure units and the collectors and storage tanks must be able to withstand the working pressure. When city water is used directly, pressure-reducing and relief valves must be installed to protect the system because the pressure can be greater than the working pressure of the collectors and storage tank. 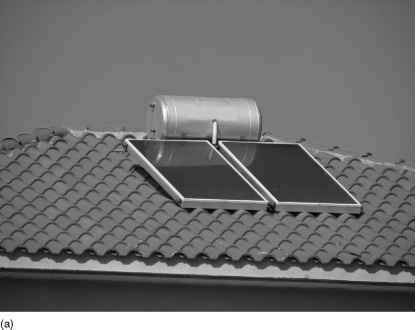 In gravity systems, usually installed where the city water supply is intermittent, a cold water storage tank is installed on top of the solar collector, supplying both the hot water cylinder and the cold water needs of the house. This makes the collector unit taller and less attractive. Another disadvantage of the system is related to the quality of the water used. As the system is open, extremely hard or acidic water can cause scale deposits that clog or corrode the absorber fluid passages. Typical collector configurations include flat plate, shown in Figure 5.2a, and evacuated tube collectors, shown in Figure 5.2b. Thermosiphon systems can be built with freeze protection devices, ranging from dump valves or heaters in the bottom of the collector header for mild freeze areas to inherent freeze resistance by using a natural circulation, antifreeze closed loop between the collector and the tank (Morrison, 2001). 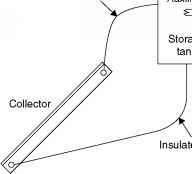 Why pressurized storage tank thermosyphon? 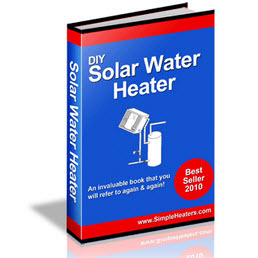 Why pressurized closed loop thermosyphon solar hot water systems?